Select the best products and services on ActiveActivities using the Top 25 Most Popular Awards. 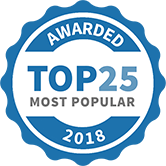 We celebrate the highest quality products and services in your community by releasing our Top 25 Most Popular Kids Activity Awards at the beginning of each year. These Awards are allocated to the businesses on ActiveActivities that have the highest number of visits, positive reviews and overall engagement from our website users, by location, for the previous calendar year. The rankings are thus determined by the behaviour of the visitors on the ActiveActivities website. Congratulations to the businesses that received these awards! 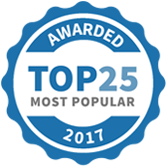 To ensure you’re using a Top 25 Most Popular business, keep an eye out for the badges above that appear on award-winning listings across ActiveActivities. For more general information about the Most Popular Awards Program, please click here. If you are a Business Owner, please click here for more specific information about the Most Popular Awards Program.